Nigeria’s Federal Government may heed the advice of a special committee it set up, which recommended the establishment of Special Courts to prosecute the rampant cases of oil theft and bunkering in the Niger Delta region. 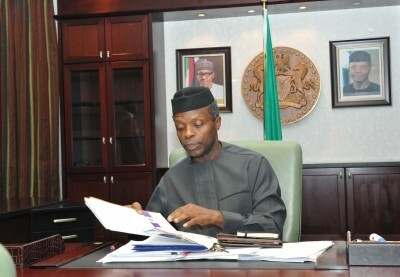 The Committee, headed by the Deputy Governor of Bayelsa state, Rear Admiral Gboribiogha John Jonah, made the recommendation to the National Economic Council (NEC) meeting, which held on Thursday at the Aso Presidential Villa, Abuja, presided over Vice President Yemi Osinbajo. it also recommended engagement of traditional rulers to sensitize their communities on the criminal and environmental dangers of oil theft. Honourable Minister of Finance (HMF) reported to the Council that the balance in the ECA stood at (USD 2,259,688,878.06 billion) as at 30th April, 2016. She disclosed that interest accrued on the account is USD 429,903.55 for the month of April 2016 experiencing a little drop in interest. The Chairman of Council, the Vice President informed that His Excellency, the President has approved the reconstitution of the board, which will be effected in due course. Edo State Governor reported to the Council that their sub-committee endorsed the forensic auditors firms as earlier proposed by the Finance Minister to audit the ECA. Bayelsa Deputy Governor reported to the Council that, the Committee set-up sometimes in 2013 consulted widely with relevant stakeholders including the Armed Forces Joint Task Force (JTF), Oil Companies, Oil Producing States, Nigerian Security and Civil Defence Corps (NSCDC) among others. Non availability of petroleum products in the Niger Delta Area also responsible for reoccurrence illegal bunkering. Procurement and deployment of appropriate technology in surveillance and combat vehicles/boats in difficult terrain would drastically reduce incidents of oil thefts and illegal bunkering and this would ensure full benefits of uninterrupted supply. Federal Government should set up special courts for speedy prosecution of oil bunkerers and oil theft suspects. Engagement of traditional rulers to sensitize their communities on the criminal and environmental dangers of oil theft. Increase the refining capacity of the domestic refineries through relocation/co-locating smaller cost-efficient refineries within time frame of 12 – 24 months. Focus on restoring upstream production by positively engaging host communities to put the current militancy to an end. Focus on improving Government funding in the upstream sector where funding has been less than 30%. Relieve Government of monthly cash-call funding and create a sustainable self-funding arrangement. Continue to engage the general public and all stakeholders by providing relevant information and education. Fuel scarcity was due to non availability of FOREX as a result of significant decline in government foreign earnings due to 60% drop in global crude oil price compared to 2014. NNPC supply dynamics had crumbled and NNPC is now straining to supply over 90% of the national demand for PMS from the 48% it was designed to supply. Prevalent hoarding, smuggling and diversion of the product have reduced volumes available for citizens/end users. Scarcity has created abnormal increase in prices resulting in our people paying an average of N150 – N300 per litre. Continuous upward surge of prices across the nation. Minister for Budget and National Planning made a presentation to the Council on Strategic Implementation Plan for the 2016 Budget of Change. Implementation of 34 priority actions across 4 fundamental areas to progressively facilitate true national transformation. Improving security and tackling corruption. Diversifying the economy by fast-tracking Industrialisation, Agriculture and Agro-Allied Processing, as well as attracting investment into solid minerals, Tourism and Entertainment sectors. Priority critical infrastructure, focused on increasing investment in power, rail, roads and housing. The Strategic implementation plan would be incomplete without a focus on systematically tracking the achievement of actual outputs and outcomes. The M&E reports will be an input into the process for capital allocation releases to MDAs. NBS tracking of statistical indices are critical in measuring performance and rewarding delivery. Council then approved the Fiscal Sustainability Plan. Nigeria was once a mining nation and ranked as a leading producer and exporter of columbite, sixth producer/exporter of the metal and producer of coal amongst others. Nigeria lost those positions due to greater attention to oil exploration and exploitation, and also the indigenisation Decree of the 70s that led to the departure of the multinationals that owned the then Tin and Columbite mines.